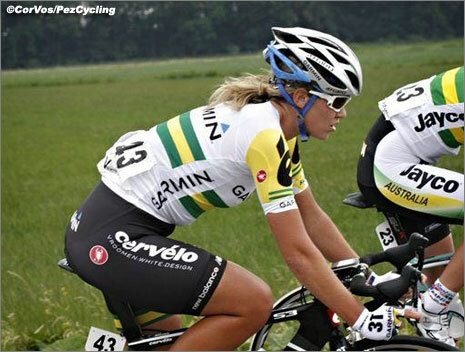 The green and yellow of the Australian national champion is one of the most distinctive jerseys in professional cycling. 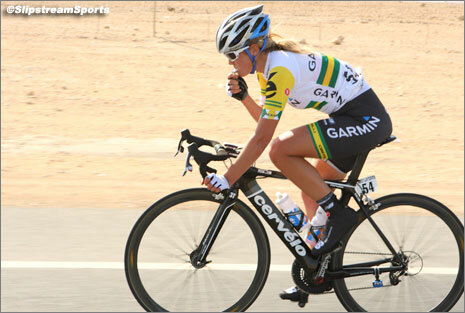 PEZ recently got the chance to talk to the proud wearer of the jersey in the women's peloton for 2011: Garmin-Cervelo's, Alexis Rhodes. PEZ: Do you have any nicknames? Alex or Al. The Australian way is to shorten everything. PEZ: Do you prefer coffee or tea? PEZ: Beer, wine, something else? That's a hard one. I've got a bit of a sweet tooth, so pretty much most desserts I'm pretty happy with. PEZ: Do you have a favorite pre or post race food? I'm pretty happy with pasta and tomato basil to tell you the truth. Something pretty plain. PEZ: What would your last meal request be? Probably sticky dough pudding with ice cream. PEZ: What kind of car do you drive? Dream car? I actually have a scooter. It's pretty cool. It's yellow. My boyfriend has a Nissan Merano, so I guess I drive that a fair bit. Dream car? Probably be a little Mini Cooper S sports car the sports model. I'd probably go for something flashy. PEZ: Do you train with power? PEZ: Do you have a favorite work out? Motorpacing is probably my favorite. PEZ: What are the top artists on your MP3? I like most Aussie rock bands. I don't really have one favorite, to tell you the truth. I don't mind Keith Urban at the moment. PEZ: Do you have any secret talents? Not really. I wish I did. I guess my secret talent is not having any secret talents. PEZ: What comes with you in your suitcase when you travel? I'm pretty forgetful so I often end up buying things wherever I go. I guess my wallet. Yeah, definitely my wallet. PEZ: What's your favorite place to ride? Probably Adelaide in Australia. Just because I've trained there so much and I know the roads. I'm also really like Girona at the moment. PEZ: What's the most interesting place that you've slept as a bike racer? I guess India. I was there for the Commonwealth Games last year, and that was interesting because it's nothing like I've ever experienced before. It seems like it's chaos all the time. I don't know how, but they manage to get things done. There seem to be a million people around all the time. PEZ: What was your first bike? PEZ: How did you get into bike racing? Through school sports. I was in a small town called Alice Springs and we had a track carnival for our school sports and I just loved it. PEZ: Do you have any plans to return to track for the Olympics? I'd love to, but there are a lot of Australian girls who are very talented, and I'm focused on getting some good results on the road this year. I'm not like the Jack Bowbridges and Cameron Myers. I have to focus on one thing. I'd love to, but I'm just going to go for the road. PEZ: What place did you finish your first race? I think I won my first race on the track. I think that's the main reason why I got into it. PEZ: What race are you most proud of? Probably the national road Championship this year. It was definitely a career highlight. It was pretty unexpected, to tell you the truth. It was also very cool to have my teammate Carla Ryan come in second. PEZ: How is it having another Aussie on the team? Yeah, really cool. It's so good to have someone else with the same accent as you and who gets the bad Australian jokes. That sort of thing. It's nice. It makes being away from home a bit easier. PEZ: How often are you home? I spend a lot of time in Europe, but I still get a fair bit of time at home too! PEZ: Did you and Carla come up in any of the same programs or did you meet via the team? We sort of knew each other from the Australian Institute of Sport. She was in the program after me. I knew her, but I hadn't had much to do with her until I got on this team. It's been really good. PEZ: Do you like to train solo or friends? PEZ: If you weren't racing what would you like to be doing? I'd probably be working for my Dad. He runs a mining engineering company, and I'd probably just be everyone's assistant. PEZ: When you were a kid, what did you want to be when you grow up? I wanted to be a vet. I really like dogs. I actually don't have any pets at the moment because it's hard traveling. I always grew up with animals. We actually had a pet kangaroo for a while because my brother and my current team mate Jack Bobridge went out shooting one night and came home with a Joey. Apparently they didn't shoot the mother. We had that for a while and then gave it to a sanctuary when it grew up. 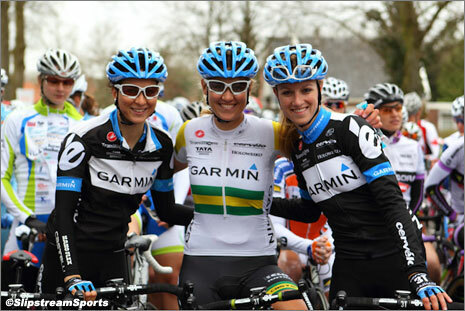 PEZ: What was it like to join Garmin after Vera Bradley? It's been really good. It's a different environment and probably a lot more professional. I think that's the best way to put it. It's a lot bigger team. It's nice. PEZ: What do you think about being attached to a ProTour men's team? I think it's really good. It's nice to see another side of the sport. 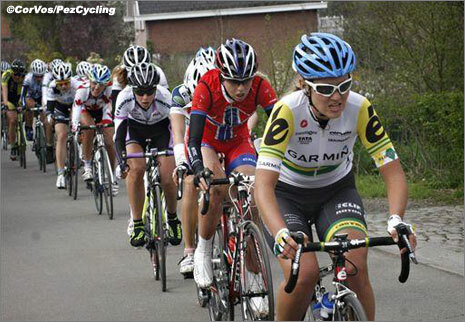 It gives a lot more exposure to women's cycling than if we were a stand-alone women's team. I think it's really good. 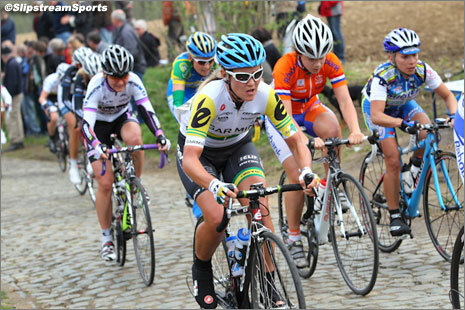 PEZ: What do you think to could be done to bring the women's side of the sport forward? I think it would be really good to have more women's races at the same time they have men's races. They have Flanders on the same day as the men's race. Things like that, and then you have the media coverage as well. Getting that half an hour or hour on TV gets the sponsors exposure and when the sponsors get more exposure then they want to bring more money to the teams and they see that they are getting value for their money. PEZ: Is there a men's race where there isn't a women's version that you'd like to do? Yeah, probably Paris-Roubaix. It would be pretty awesome. PEZ: What's your opinion on this year's radio rulings? Yeah, I think it's really bad. As far as safety is concerned, you have the whole argument that having a radio doesn't make the race as exciting, but I don't think that's true. I think, for me it's a saftely thing. It's nice to know that in 20k, especially in women's racing because we don't get the same road closures and people around them and security and things like that, in 20k there's a horse running along the side of the road. Or you're coming up to a train crossing. Things like that. You get a lot more confusion than if the director is just telling you what's going on. PEZ: How long have you been in Spain? I came here for a month in January for a team training camp, but this year is sort of the first time I've been here. It's nice in Girona. It's the team base, but I know a lot of Aussies here, so it's nice to be around people from home. It makes you a little less homesick. PEZ: Do you get pretty homesick during the year? I miss friends and family really. I've got a boyfriend in Aus, so it's sort of hard to pack my stuff for seven months and say "I'll see you seven months." PEZ: What are your goals when you finish racing? I'm studying engineering at the moment, part time. It will probably take me another thousand years, but I'll try to become a civil engineer. PEZ: What do you take with you when you train? Usually my iPhone because it's got the iPod on it. PEZ: If you could have dinner with any famous person living or dead, who would it be? That's a hard one. I don't know Michael Jackson would be pretty interesting. PEZ: What are your biggest goals within the team? I think for us it's to be successful riding together and win some races. PEZ: What advice would you give to an aspiring racer?